Like many blog readers, I've been searching for a replacement for the beloved but soon-to-depart Google Reader. 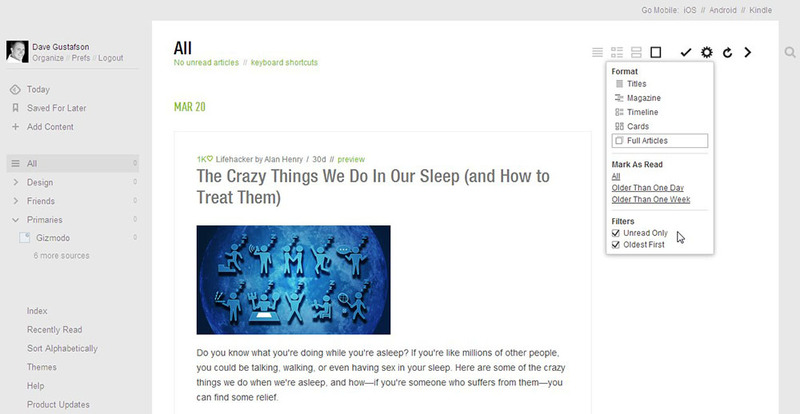 Feedly has emerged as the heir apparent, and with good reason: it's attractively designed, cross-platform, customizable, and duplicates the vast majority of Reader's functionality. 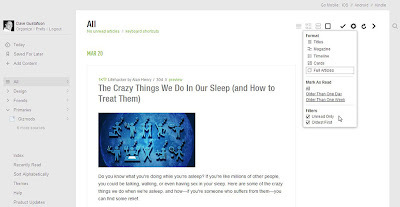 However, there are a few surprising holes in Feedly's offering - and I thought I'd point them out here so fellow migrators will be warned, and maybe even the Feedly team will take notice and fix them! Next Article / Previous Article: These are literally unpressable buttons because they don't exist: they're available as keyboard shortcuts, but not onscreen buttons. Making them keyboard shortcuts acknowledges them as worthwhile - so shouldn't I at least have the option to use my mouse for this interaction? Save For Later: The location of the save-for-later button (the equivalent of "starring" in Google Reader) is illogical: it's only at the end of each article. If I'm saving something for later, it's likely because I haven't read it - which means I haven't gotten to the end of the article! Give me this button alongside the headline - that's where I really need it, especially in the full-article view mode I use most. Unread Only: I use the "unread only" filter - but the way this filter actually works seems to be: "unread only, unless there are no unread articles, in which case show all articles." I hope this is a bug and not an extremely poor design decision! It's especially bad since I also filter by "oldest first" - so when I log on, I see either (a) new unread articles or (b) hundreds of month-old articles. If there's nothing new, why not give me the satisfaction of that big green checkmark I'm beginning to love so much?